This past Sunday, November 16, we were so pleased to be able to donate $1000 each to the Picton United Church Food Bank and the Wellington Storehouse Food Bank. As winter approaches, local food banks are seeing an increase in the number of people turning to them for support. 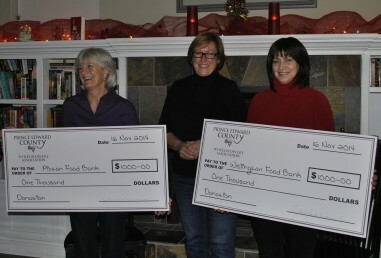 This money was raised through ticket sales for Taste Community Grown, the food & wine market held in late September at the Crystal Palace in Picton. Thanks to all who attended Taste Community Grown, it wouldn’t be possible without you!